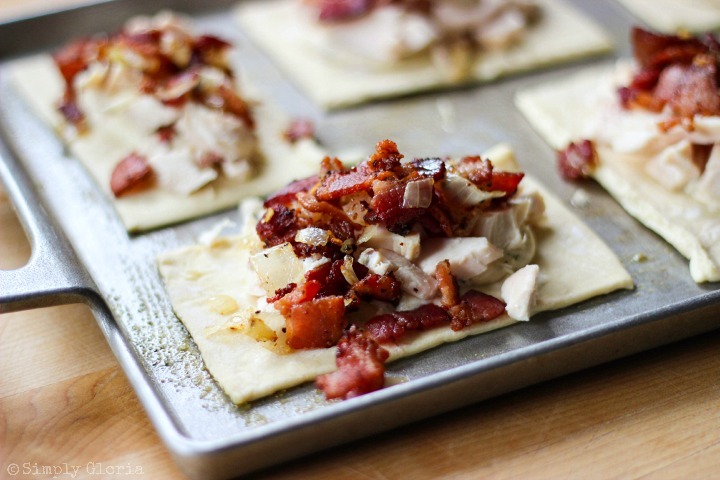 Easy and delicious puff pastry sheets filled with a creamy Alfredo sauce, tender chicken and crispy bacon. Any deliciousness stuffed inside of tender dough and baked is definitely a favorite over here with my guys. Especially with chicken! 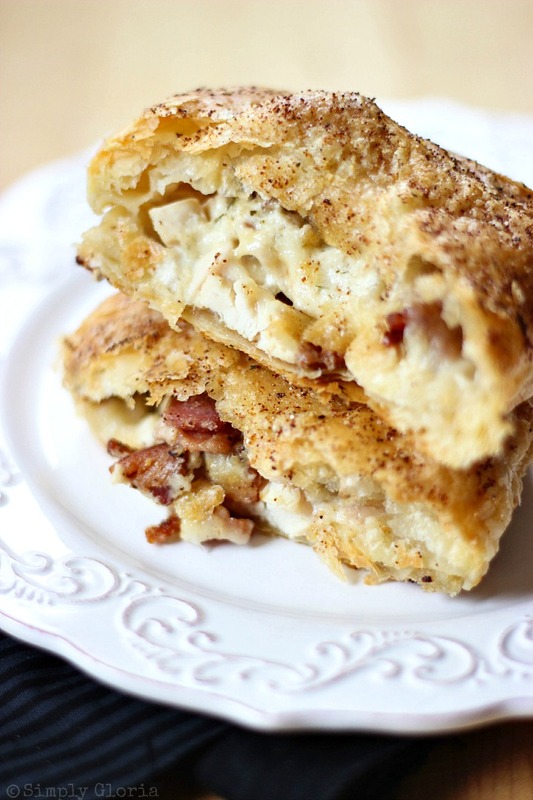 When you take a bite out of a Chicken Alfredo Bacon Pastry Pocket, it is melt-in-your-mouth good! 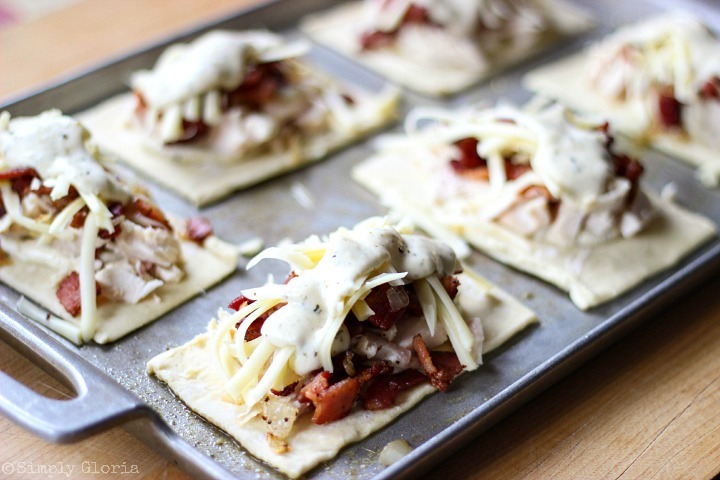 Decadent cream sauce surrounding crispy bacon pieces sauteed with garlic and onions, tender chicken, and melted cheese is all tucked inside these pastry pockets. It’s Mystery Dish day and Kristi from Inspiration Kitchen is hosting this month! If you haven’t seen all what she creates in her kitchen yet, be sure to take a look around while you’re over there. Such talent and creativeness! Here are the ingredients Kristi put together and challenged us bloggers to choose at least 3 ingredients for each of our creations: apricots, asparagus, vidalia onions, fennel/tarragon, chicken, puff pastry, coconut, cashews, chocolate, and pineapple. What ingredients would you love to put together and make with this list?? 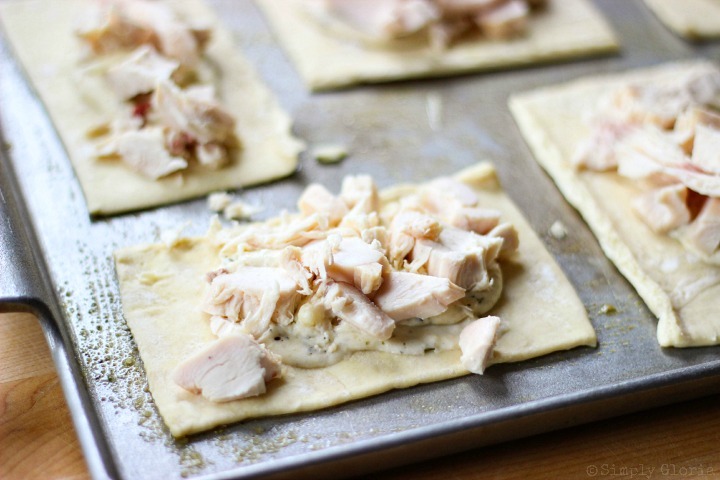 I for sure wanted to use puff pastry… because it’s SO easy to use with sweet or savory! I’ve already created other easy puff pastry recipes with cinnamon chips, cheesecake filling, pumpkin caramel, and pastry doughnuts. So, I thought I’d share with you easy stuffed pastry that I make all the time for my guys when they come home for lunch. You are going to love how delicious these turn out AND how easy it is to make! When the bacon is almost at your desired crispness, add the chopped onions and minced garlic and saute for a a few minutes. 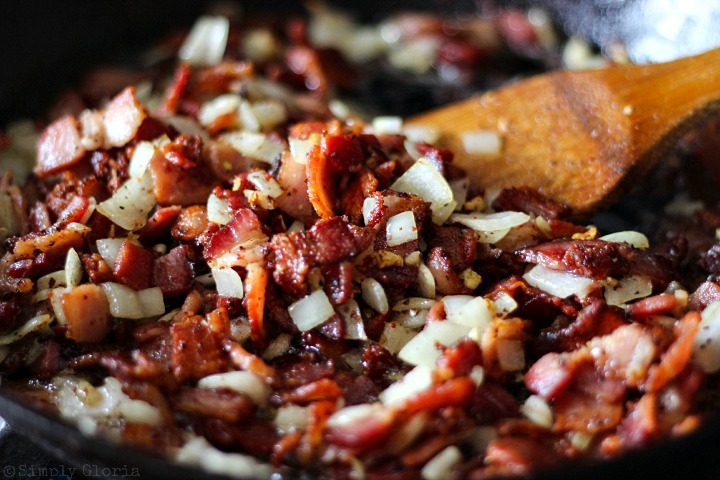 The aroma of bacon, garlic and onions is enough to get them excited for lunch or dinner, right? 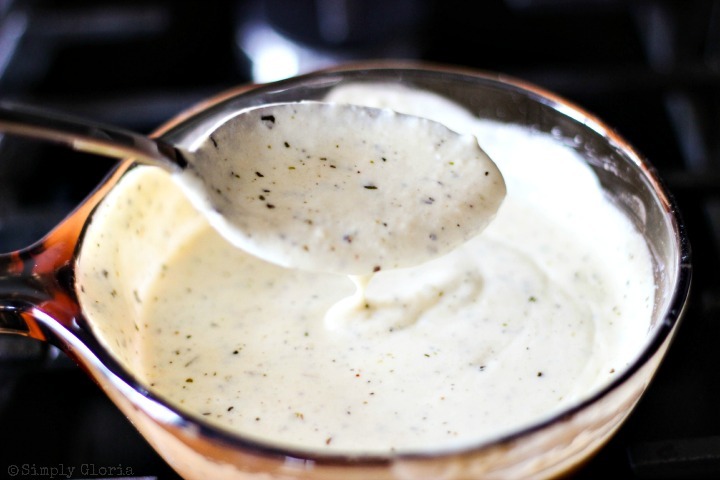 This cream sauce is seriously so quick… and easy! Cut each sheet of pastry into 6 rectangles. 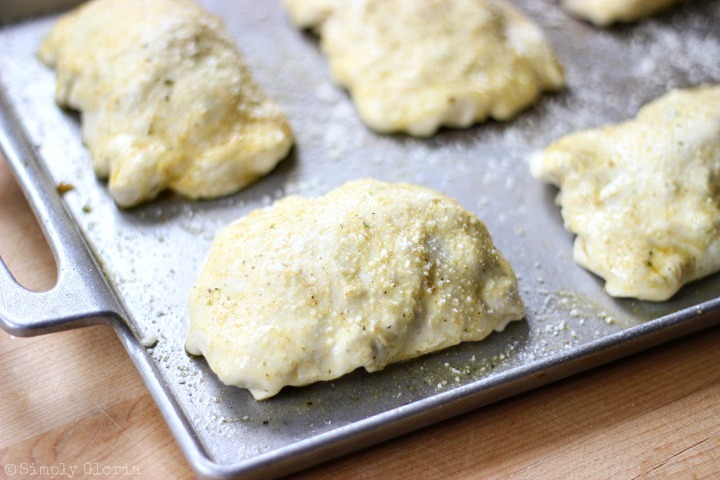 Lay the first six pieces onto a baking sheet covered with the mixture of olive oil and garlic powder, to prevent the pastry from sticking on the bottom. 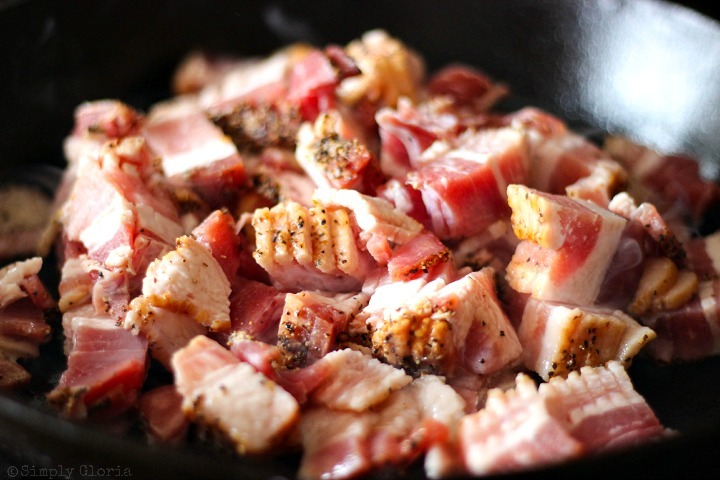 Don’t be afraid to pile on the bacon mixture! Sprinkle on the shredded cheese and another drizzle of cream sauce. Stretch out the other 6 pieces just a little bit to fit over the top of each covered rectangle. Tuck the pastry under the bottom. Don’t worry about making all of it completely sealed. These are really great to freeze (after baked) and warm up for snack time! See what everyone else from the Mystery Dish Club made this month! 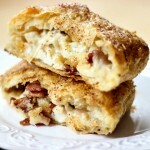 When you take a bite out of a Chicken Alfredo Bacon Pastry Pocket, it is melt-in-your-mouth good! 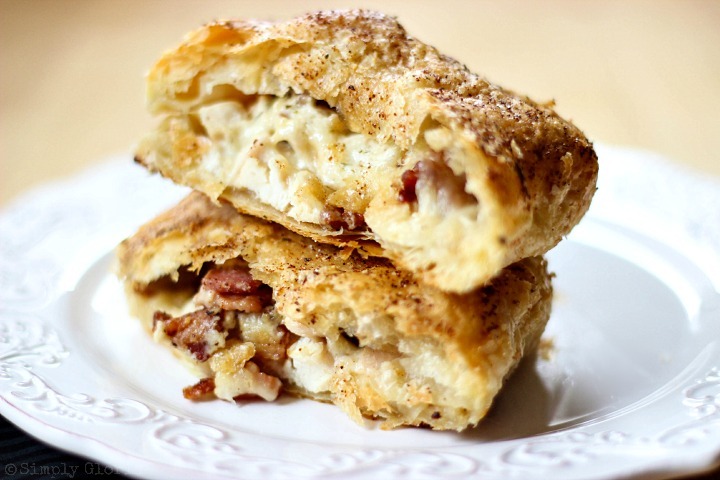 Decadent cream sauce surrounding crispy bacon pieces sauteed with garlic and onions, tender chicken, and melted cheese is all tucked inside these pastry pockets. 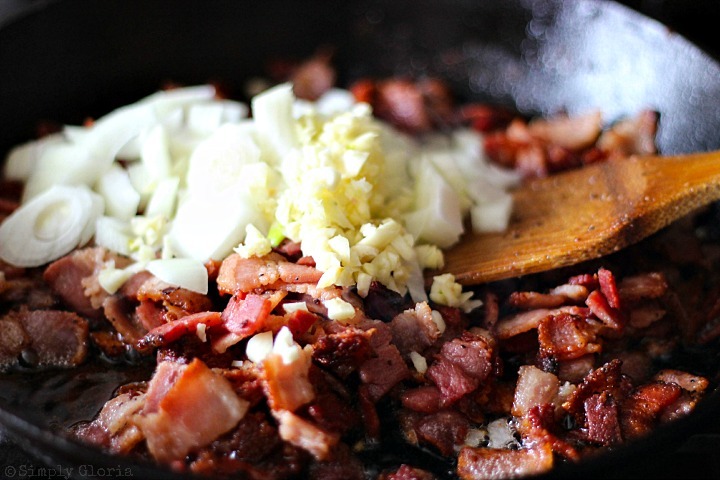 In a heavy skillet on medium heat, fry the cut bacon. When the bacon is almost to your desired crispiness, add chopped onion and minced garlic. Saute all together for a few more minutes and drain excess bacon fat. Set aside. Combine 3 tablespoons of olive oil (or melted butter) with 2 teaspoons garlic powder. Brush on the cooking surface of a large baking sheet. Cut each sheet of pastry into 6 rectangles. Lay the first six pieces onto a baking sheet covered with the mixture of olive oil and garlic powder, to prevent the pastry from sticking on the bottom. Put a about 2 tablespoons of cream sauce in the middle of the six pastry pieces. Followed with the cooked, chopped chicken and bacon. Sprinkle on the shredded cheese and drizzle on more cream sauce. Stretch out the other 6 pieces just a little bit to fit over the top of each covered rectangle. Tuck the pastry under the bottom. Don’t worry about making all of it completely sealed. Brush the remaining olive oil and garlic mixture on top of all of the pockets. Using leftover chicken or ready-made rotisserie chicken is a great way to make this even faster! When thawing the frozen sheets of puff pastry, it is recommended to start with preparing the bacon first. While the bacon is frying, proceed with the easy and quick Alfredo cream sauce. Then you will have everything prepared and ready to stuff these pockets! If using onion salt and/or garlic salt, omit the salt, to taste. Makes 6 (5 1/2 inches each) pastry pockets. So yummy! 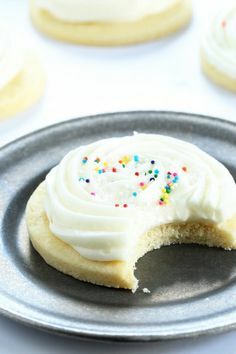 Definitely pinning these tasty treats! 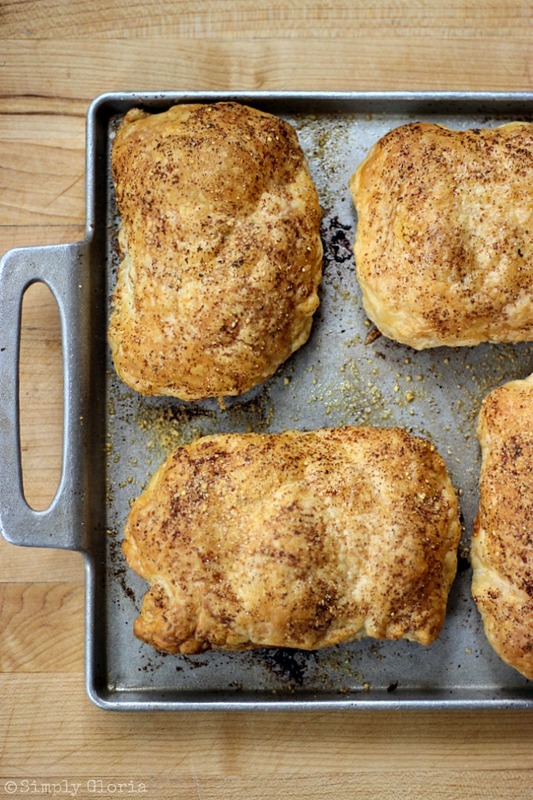 I’m all about puff pastry, and these look amazing!!! Dang girl! These look awesome! I hope you are well Gloria! That sauce though … have mercy, it looks fantastic! Your photos are stunning and ugh, the description of these baking is almost too much. 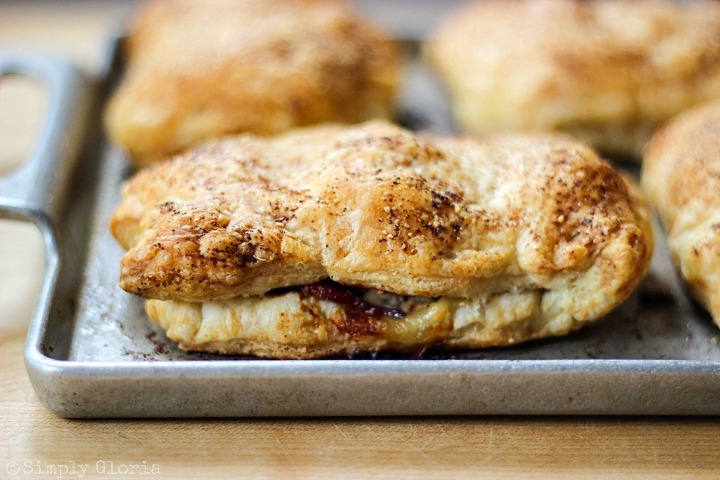 Garlic and bacon and puff pastry, you truly cannot go wrong! I must say the photo for this recipe is what caught my attention. They look wonderful. And they are good…however not worth all the work. Not sure I’ll make these again — I have another Chicken pocket recipe from the Jr. League of Indianapolis that uses cream cheese, chicken, onions, pimento wrapped in crescent rolls that have more flavor and are much easier to make. It might be easier to mix all of the ingredients that go inside together vs. trying to layer it all on — I found that to be a little difficult to get enough filling inside each pocket. That way the chicken, bacon, onion, cheese and sauce would all stay together when trying to pile it on to wrap and close. After trying the Baked Italian Sausage and Gnocchi recipe from this site that was wonderful…had to try this. But the gnocchi recipe is outstanding. Wish I could say the same about this one. 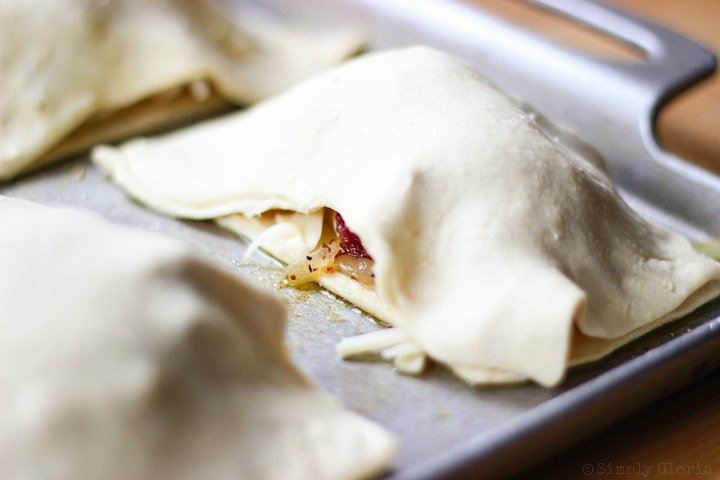 I am always looking for more ways to use puff pasty – I am making this tonight! Chris recently posted…What Is A Chef De Partie? This Alfredo recipe was a gift from the gods. Bacon and chicken mixed together equals heaven and I love the seasoning recommended. Thanks for sharing this awesome recipe.